Everyone seems so excited about the canal transit. Me, I’m overwhelmed with all the planning and paperwork not just for this step, but for the next three or four in our Pacific journey. Everything is complicated by the lack of wifi in the marina and the marginal cell signal that makes sending and receiving email akin to tending a tiny fire with damp kindling and hoping the breeze doesn’t blow it out before the bigger sticks catch. 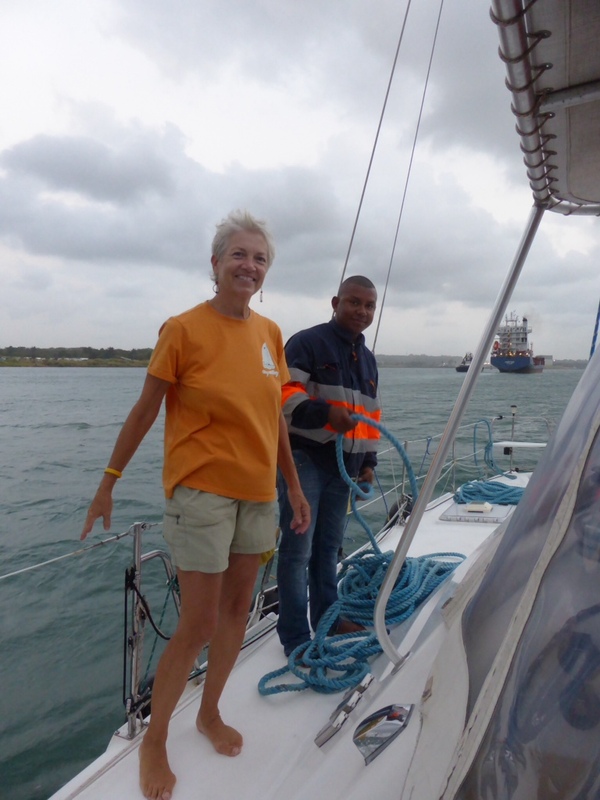 We had a detailed briefing from Peter and Monique from Deesse who went through on another boat as line handlers. We weren’t much concerned about the locking part because we’d done that many times in the rivers of Pittsburgh. I was more obsessed with what I was going to serve six people for five meals and how I was going to keep everyone fed and watered while I was line handling. We topped up the water tanks and confirmed that we had plenty of fuel. Our hired-on line handler — we need four, not counting Jack, who must be on the helm at all times — was friendly and helpful and spoke little English but we managed to communicate anyway. His name is Erick just like our agent so we told our agent we’ll call him Lil’ Erick. He laughed. Our start time was pushed back to 5pm from 3pm but Lil’ Erick wanted us to get to the flats, the staging anchorage for small boats, by 1pm anyway just in case. Nancy made sandwiches for lunch and I had dinner started, but as soon as we got the anchor down I went below and took a nap. The last few days of very little sleep got the best of me and I slept despite the rolling. A pilot boat finally made the rounds of the anchorage dropping off the “advisors.” As a small boat we don’t get a pilot, just an advisor who directs the helmsman through the canal. Our advisor is Fernando and it turns out he’s a devout Baptist who takes his vow to spread the good news seriously. EV and two monohulls were the last of the yachts to leave the flats. 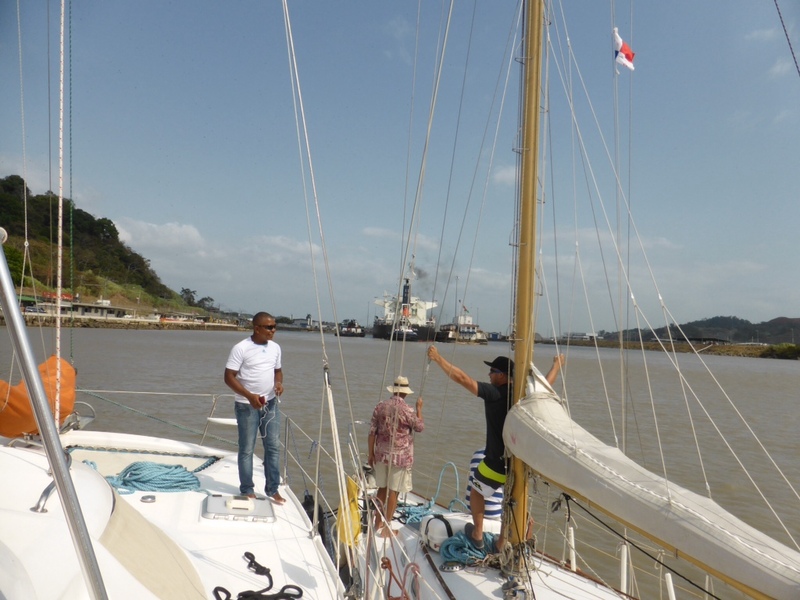 We hoped we would be rafted in the middle — that means no line handling for us — but as we approached the Gatun locks Jack was instructed to raft up to port of a monohull that had a couple of feet on us in length. That meant Erick, our hired line handler, and I will be responsible for keeping the left side of the 3-boat raft-up steady and centered in the locks as the water flows in. There are three chambers in this set of locks, so we will do this three times, lifting 29 feet each time. Men on the lock walls toss small lines with monkey fists to the boat and we tie our big fat lines on and they are hauled back to the wall of the lock and looped over bollards. 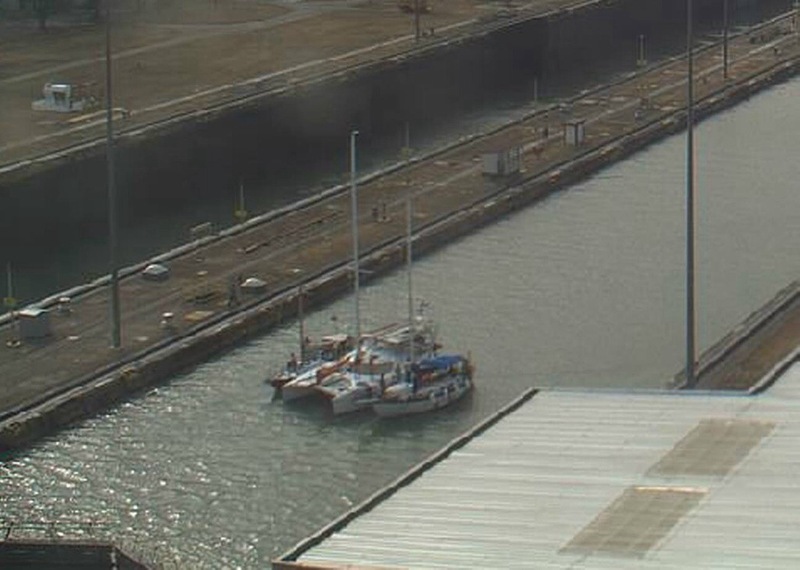 The small boat on the right side of the raft-up also has lines bow and stern so we three boats are held in place by four big lines attached to the walls of the lock. This is the only part that’s different for us in locking through. In the rivers of Pittsburgh small boats are held against the side wall of the locks but you still have lines to tend. As the water lifts us our job is to keep pulling in our lines so we stay nicely centered and stable. As we get to the top of each lock, the men on the lock walls drop our heavy lines into the water and we haul them back aboard, the small lines still attached. The canal men walk alongside holding the small line as the center boat motors us the 1000 or so feet into the next chamber. When we ‘re about in the right place our heavy lines are pulled back to the lock walls and dropped over a bollard and we start all over again. By the second chamber I was wishing I had dug out my sailing gloves. Those fat lines are hard on the hands, especially when they’re wet and salty. 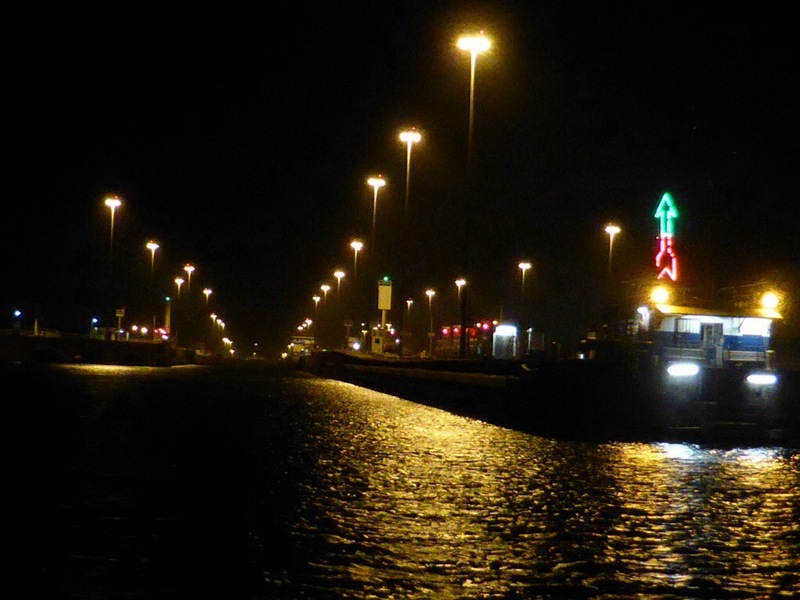 We got through all three chambers under the bright sodium lights of the Gatun locks and emerged from the last one into such darkness that we were all blinking, trying to regain our night vision. We pulled out our rarely used handheld spotlight to find the big mooring puck we had to tie up to and got secured about 10pm and dropped into bed exhausted. A few more boats showed up an hour later but I never even heard them. As usual, Dave and I were the early risers and while we were enjoying coffee in the cockpit I heard an announcement over a PA system. “The breakfast buffet is now open. You are invited to the breakfast buffet.” Hey, sounds great to me! While I looked around for the breakfast buffet, Dave laughed and pointed out the small canal tour boat anchored just behind us but mostly hidden by our stadium seat. We could see the guests lining up for what we imagined were made-to-order omelets and pastry. I served our crew breakfast burritos with Bahamian peas and rice and roasted Caribbean pumpkin. That will have to do. 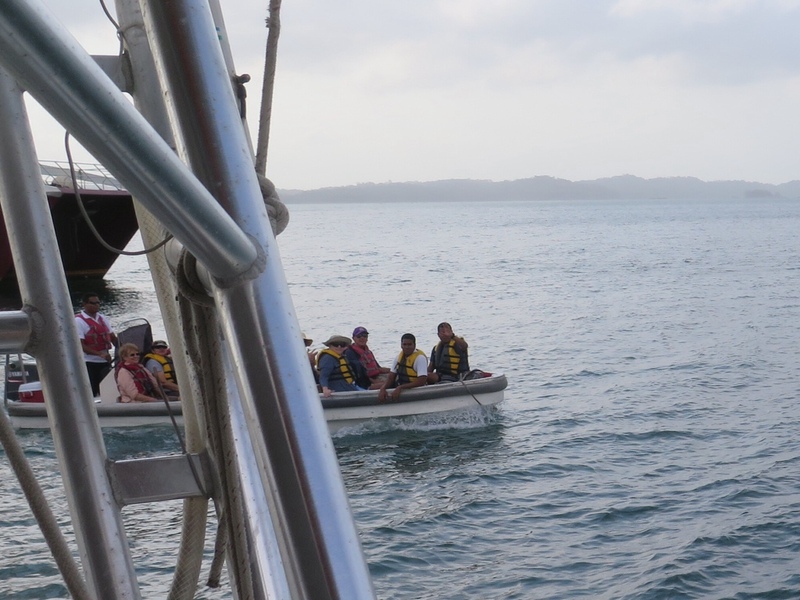 While we were eating the tourboat passengers were ferried ashore in small boats and they took photos of us as they passed at close range. That’s a funny thing we’ve noticed as we travel; we end up in people’s vacation albums and slide shows. 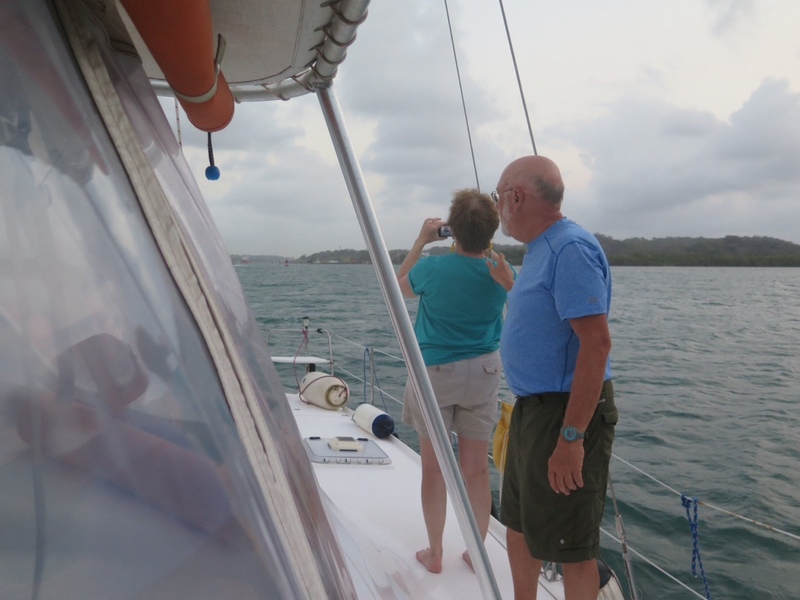 Our advisor was late getting back to us and we finally started on the 26-mile motor across Gatun Lake at about 10am. The delay put us in company with two smaller monohulls and we adjusted our speed to match the slowest boat. Nancy and I made the sandwiches for lunch and got dinner ready to go into the oven later. While we cooked we could hear Fernando engage our resident scientist Dave in a discussion on the origin of life. It was clear they had different viewpoints and I decided that was as good a time as any to go below for a nap. When I woke up a few hours later we were still motoring towards the Pedro Miguel lock and without thinking I climbed up to the stadium seat beside Fernando to enjoy the view. 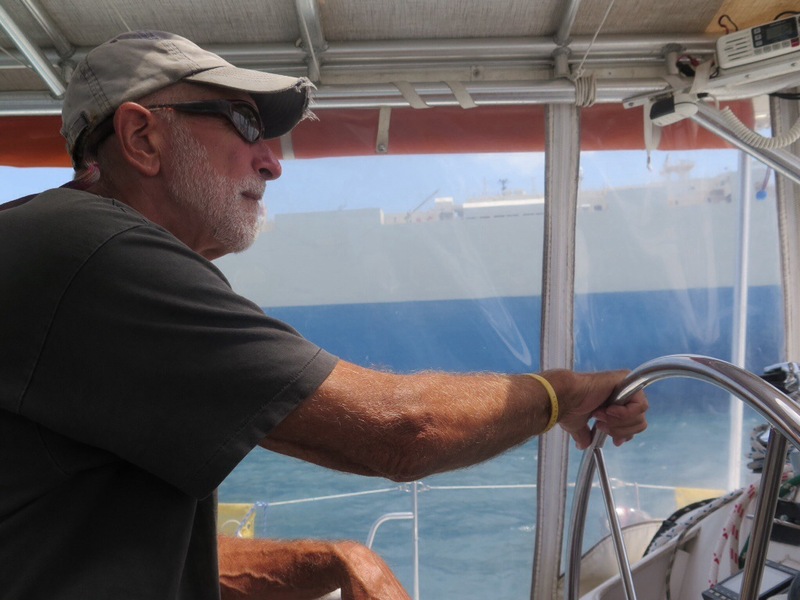 Dave, I noticed, was out on the side deck and Jack was focused on the way ahead. “How can I be a better person?” Fernando asked. “You’re in the hot seat,” said Jack. Oh boy, I thought, and Fernando launched into a convoluted argument about morality that I had trouble following. I excused myself as soon as I could and for the rest of the transit no one sat next to Fernando. 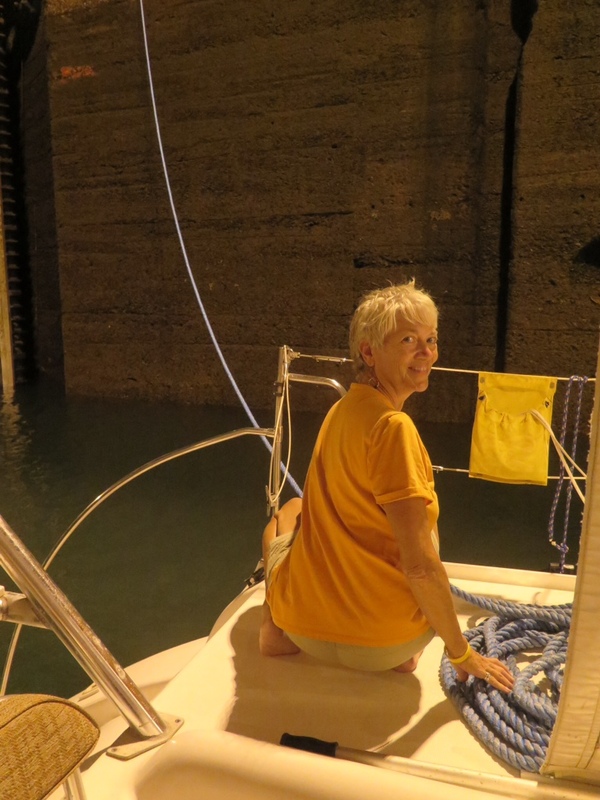 We reached the Pedro Miguel lock shortly after 3pm and the two small monohulls rafted up to either side of us before we entered the chamber. Woo-hoo! No line handling! Although that meant Jack was driving the bus, no small feat in wind and current. 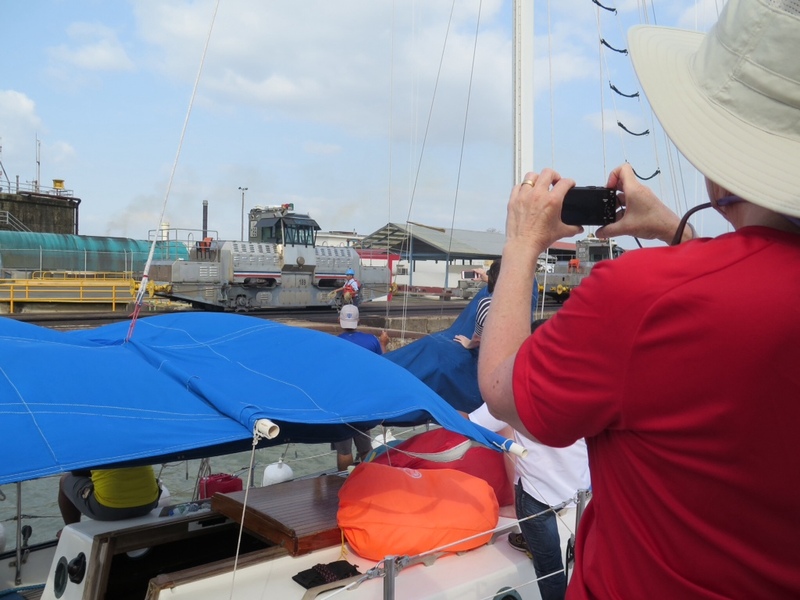 In these locks, the yachts went in first, and a Panamax cargo ship came in behind us. 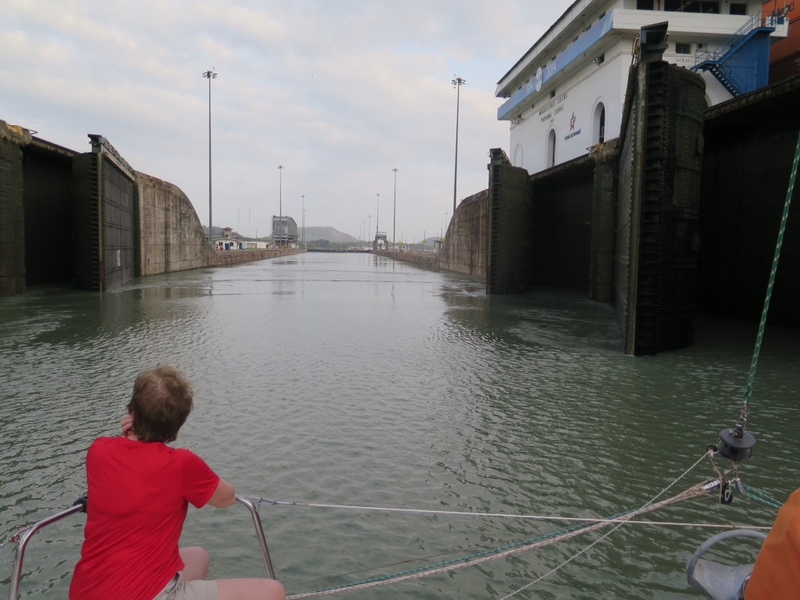 We quickly moved into the first Miraflores Lock, motored right up to the gates and tied off. Fernando pointed up to a tower on an adjacent building. 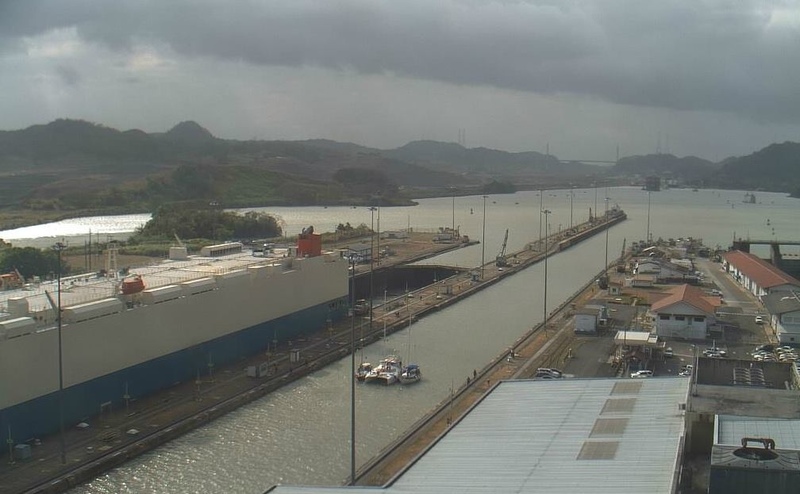 “That’s the webcam,” he said, and he logged on to the canal website to request an angle change to be sure we’d be visible. While he was doing that I checked Facebook on my phone and shrieked when I saw that my cousin Carla posted a perfect screen grab of EV and her two minions waiting patiently in the lock. Nancy and I waved furiously at the webcam and we all took turns taking photos. 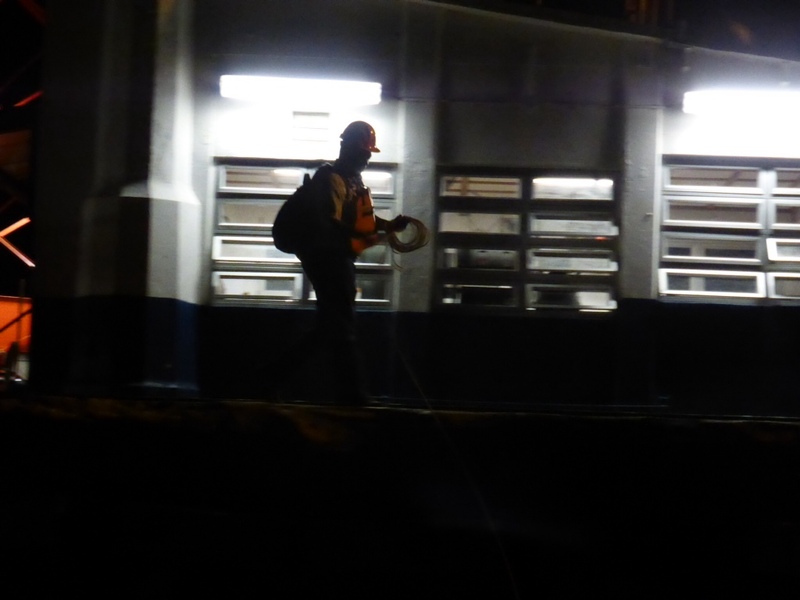 We noticed after a while that we weren’t going anywhere and looked behind to see that our Panamax friend hadn’t entered the lock yet. Then they closed the gate and we figured we were going down alone. 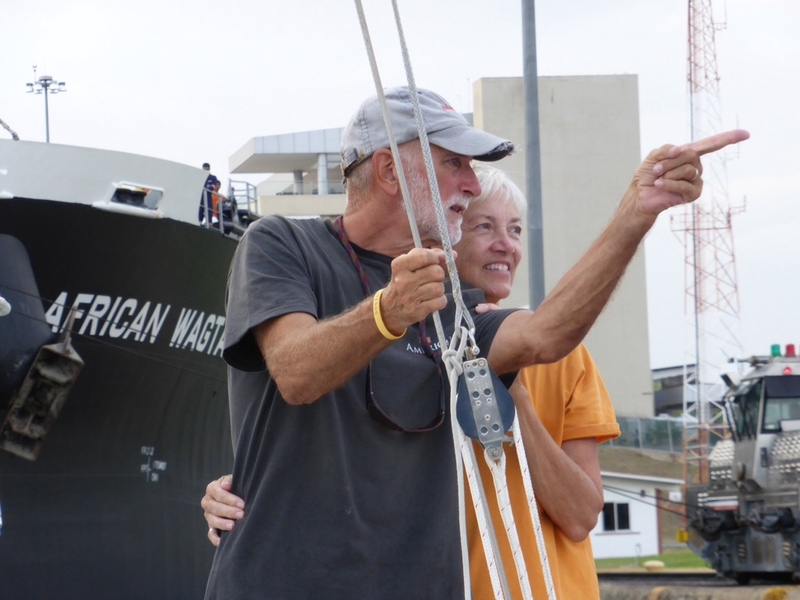 But after a while the gate opened again and our partner ship came in and we finally made the trip one step closer to the Pacific Ocean. With one more chamber to go we looked over the top toward our new cruising grounds and I welled up with a messy mix of pride in what we’d accomplished so far, anticipation for what’s ahead, and relief that we apparently did most things right when planning our haphazard Schulz-y way. The sun was fading when we motored out of the last lock. 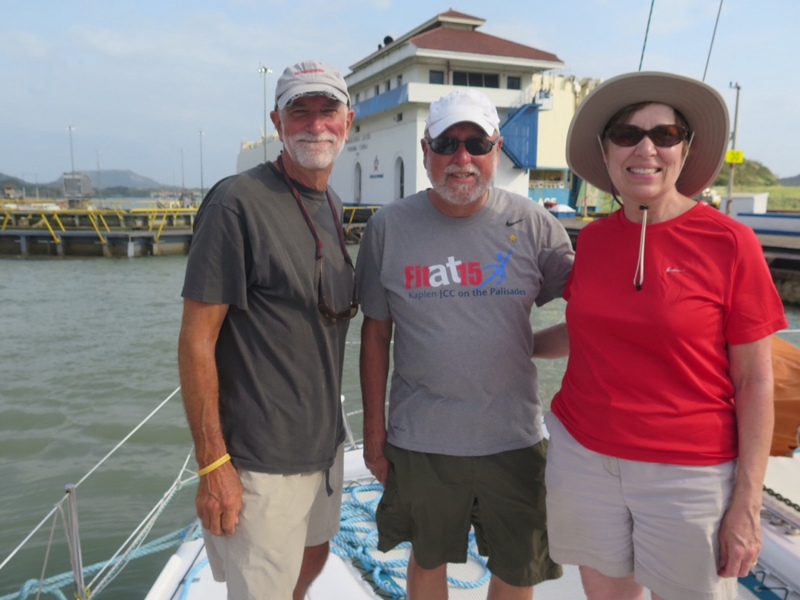 We disconnected from our partner boats and motored a couple of miles to the meet-up points where Fernando and Erick were picked up, then continued to the anchorage. We dropped the hook in total darkness and Dave popped the cork on a champagne toast to put an exclamation mark on the turning point of our journey.